Whisk the eggs, add the sugar and continue whisking until the mixture is quite thick. Sieve the flour and fold it into the whisked egg. 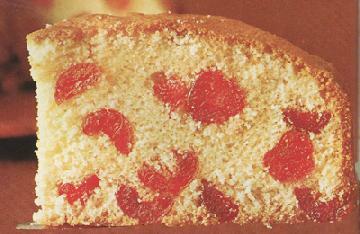 Lastly, fold in the chopped glace cherries, leaving a few whole ones to decorate the cake. Bake in a greased ring tin in a moderately hot oven (205°C) for about 15 minutes. Cool on rack. When the sponge is cold, mix the icing sugar to a coating consistency with the lemon juice and coat the sponge ring with this icing. Decorate with glace cherries, and angelica if desired.